Eggs are my favorite kind of breakfast. They are so amazing. I can just do anything with them – boil, bake, cook, roast, basically whatever – they will come out scrumptious all the same. And best part is that they cook in a snap. That leads me to this fancy sounding breakfast – eggs in purgatory. I know, the name sounds as if I am about to write about something elaborate. But this is so simple that it is ridiculously simple. Even on weekends when I make breakfast with my eyes shut (lack of sleep you see), it takes me never more than 15 minutes. Get the pan heated over medium heat. Drop in your olive oil. Add onion and let them cook for a minute. Just a minute. Add in garlic and cook for another 30 seconds or so. 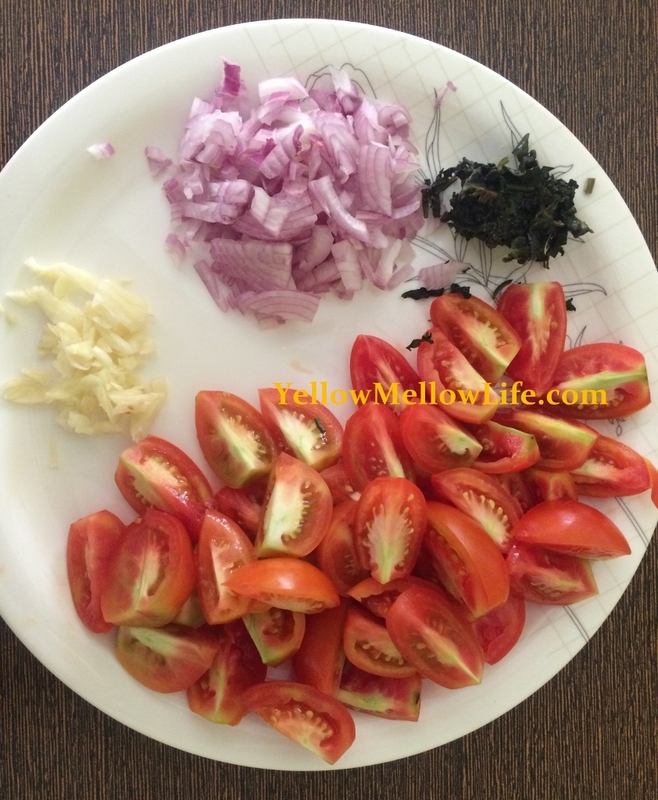 Get the tomatoes in the pan now along with salt and pepper. Also add in water and basil. I had some frozen basil so it looks weird but tastes alright. Cook everything for 2-3 minutes only. A quick taste check and see if the dish needs any more salt or pepper. Crack eggs and drop them on the tomatoes. Just make sure you drop them at a little distance from each other. Cook the eggs for 3-5 minutes. They should set by then. The end product is eggs cooked in really juicy tomatoes. And I mean really really juicy. Enjoy it as is or with toasted bread. I make eggs in purgatory almost every weekend and so I like my recipe basic. However, you can increase the amazing quotient of the dish by adding ingredients like bell peppers, pepper flakes, olives, capers, Parmesan or anything similar. Next story Yellow Mellow Life and Jabong.com – Celebrating Mother’s Day Together! Previous story What’s On Our Mind These Days? June Bugs!